Okay, I completed it months ago but haven’t had the time to blog about it. My customer, Robyn, absolutely loved it. I decided upon using various blocks. Nine patch, three bar fence rail, four patch, five bar fence rail and half square triangles. There were a few pockets that were in good shape so I used them as simple blocks. I inserted pieces of bandannas in the pockets as I quilted them. I initially wanted to use a plaid for the border but it wasn’t as bright as the rest of the quilt so it did not work. Instead I used the black shirts for the first and last border with various scraps for the middle border. The plaid was from curtains in Robin’s dad’s room. Robyn’s dad liked nautical, so we went with ocean team for quilting. 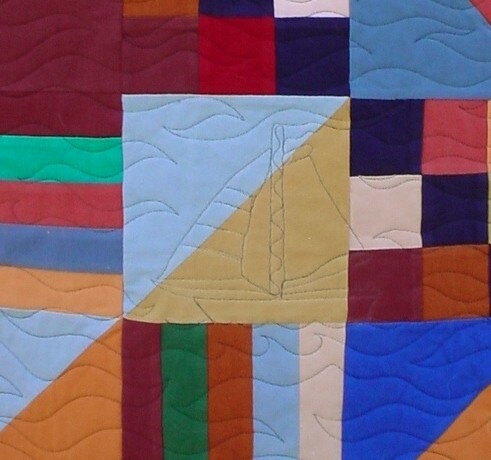 I quilted an anchor, light house, and a couple of sail boats. 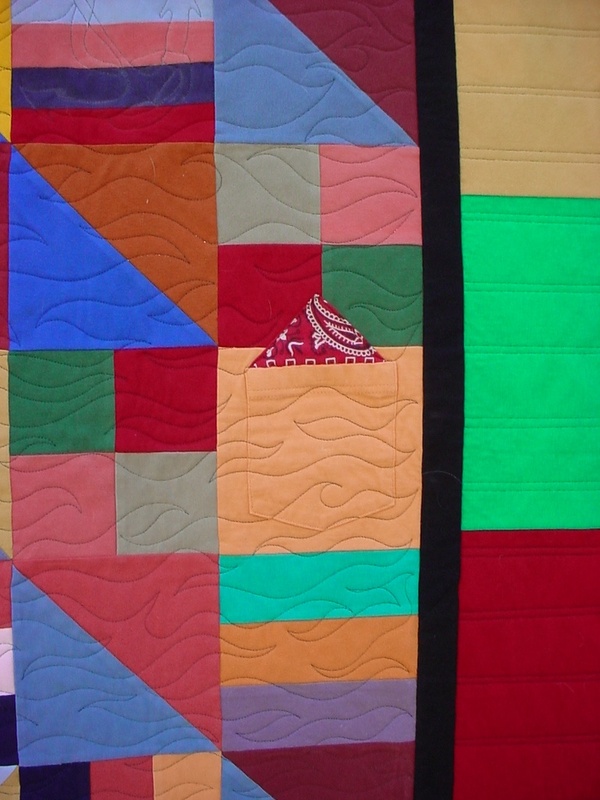 In the corners I quilted ships wheels. 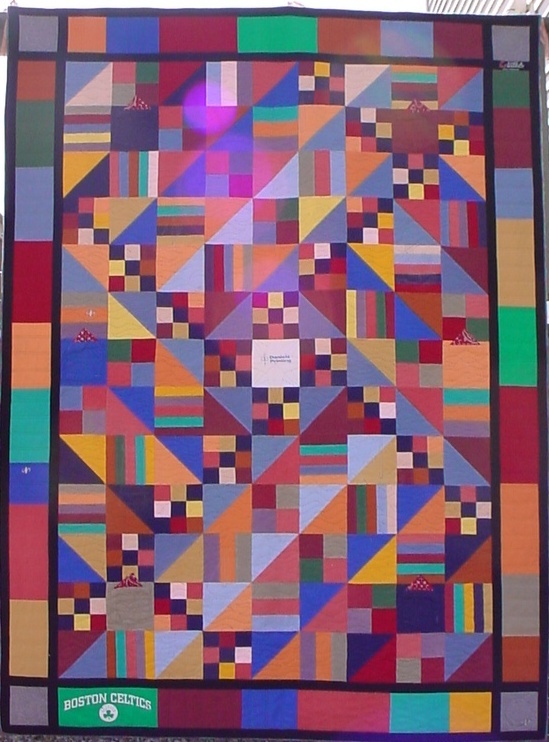 The multi-color border is quilted with a bead board effect. The plaid curtain was perfect for the binding. It really tied in all the colors. To enhance the plaid, I cut it on the bias. I enjoyed working on this quilt. It expanded my creativity. Coming up with a design that would enhance the colors. 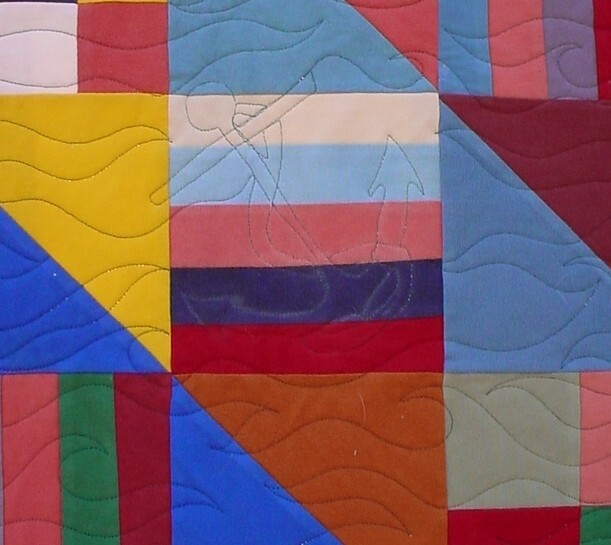 Those who have seen the quilt in person have asked if it was made from ultra suede. It has such a soft look to it. 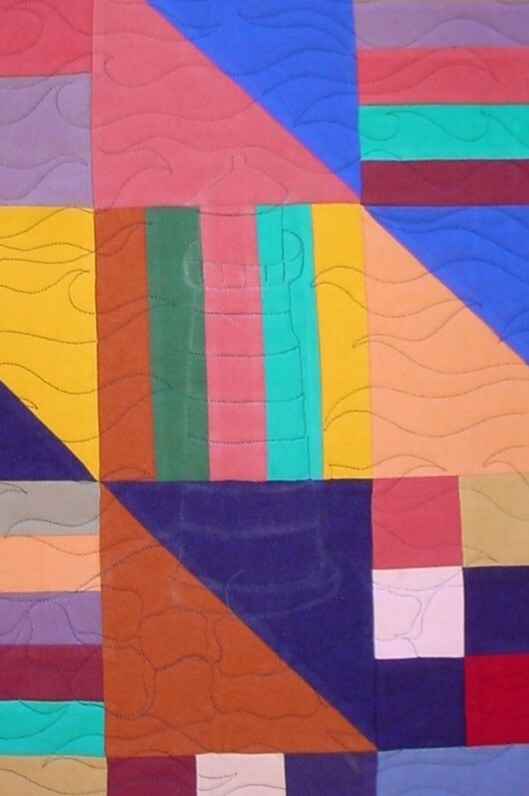 It was a challenge to work with a different medium in quilting other than 100% cotton quilting fabric. For others who wish to work with knits, you need to stabilize them first. I like using the light weight knit fusible interfacing from pellon. It gives enough stability without making it stiff. You also need to really be aware of your seam allowance and how you press them. 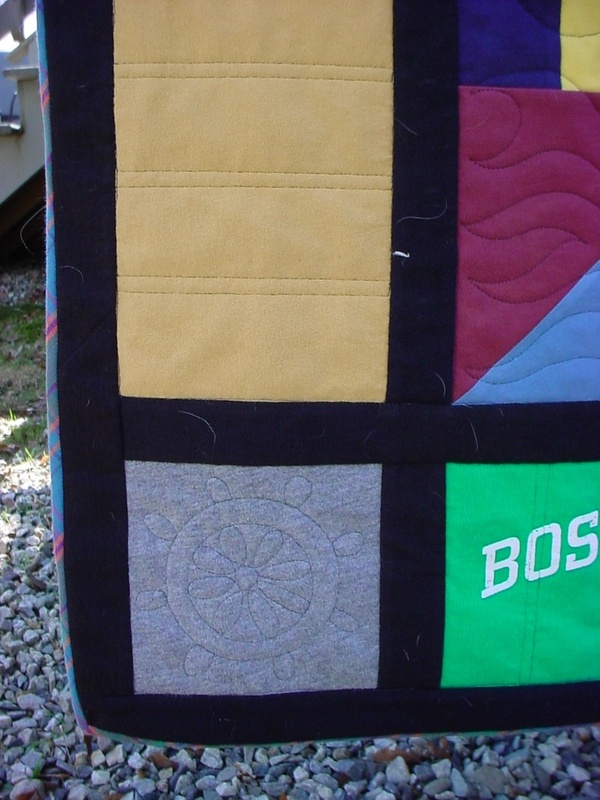 Having taken a class from Leslie Muir-Volpe on miniature quilts helped with this quilt. There were times I had to clip seam allowances in order to get the intersections flat. If they are not flat you will have issues when you quilt the top. The bulk will not fit under your presser foot. I used my longarm on this quilt. If the seam intersections were not flat, my hopping foot would push at the bulk. This would cause a pleat or distortion in the quilt top. Robyn is very happy with the result. So am I. It’s a very unique quilt that will bring lots of warmth and happy memories to Robyn. This is the most beautiful T-shirt quilt I’ve ever seen! In fact, it doesn’t even look like T-shirts. Well done!